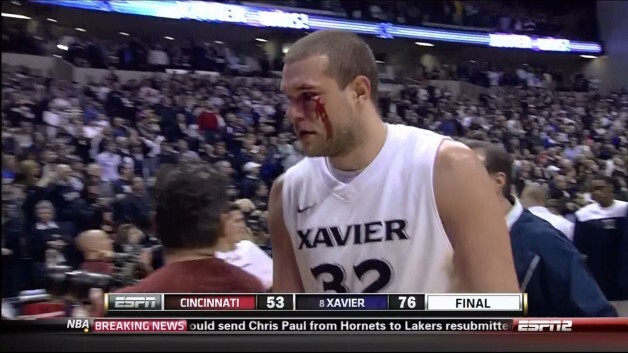 Last night Xavier’s Kenny Frease (#32), was sucker punched by Cincinnati’s Yancy Gates (#34) and then stomped in the head while he was on the ground by #13 Cheikh Mbodj. Both Gates and Mbodj have been suspended for six (6) games, and both of their actions are regrettable. However, I believe that Mbodj’s actions were much more egregious than Gates. In fact, I consider Mbodj’s kicking Frease in the head as he lay defenseless on the ground thug like behavior and has absolutely NO place in college athletics. Due to the attacks, Frease (pictured below) sustained a badly bloodied black-eye. Now please know that i have been involved with on-field fights and brawls during my time playing at Univ. of Oklahoma (like the infamous 1998 TCU v. OU), and understand how emotions can get the best of you quickly during high level competition. This is why eventhough I think he deserves more, I can live with six (6) games for Gates since he was actually on the court when the fight started. However, for Mbodji to unnecessarily come off the bench to commit an intentional battery (unlawful touching of another) has to be strongly condemned and punished to send a message of strict intolerance for such behavior. Therefore, I believe Mbodji’s actions actually warrants a full season’s suspension, mandatory anger management training, and he should be found civilly liable (ordered to pay the medical bills and pain and suffering) for injuring Xavier’s Kenny Frease (#32).